Gallagher's unique, integrated approach to access control will be showcased at the Higher Education Expo, Olympia on Thursday 17 October. In conjunction with security experts, Assa Abloy, Gallagher will use the Higher Education Expo, Olympia on Thursday 17 October to demonstrate the key features, benefits and attributes of its renowned V7.10 Command Centre system alongside Assa Abloy's advanced Aperio product range. The revolutionary Aperio product range embodies a sophisticated and elegant solution, representing the latest technological development in wireless access control. 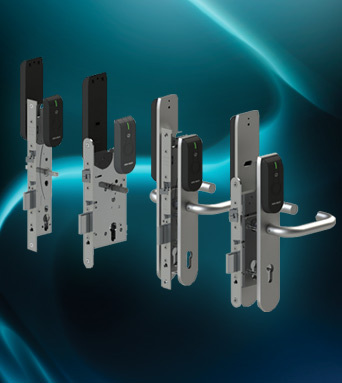 Aperio has been developed to upgrade mechanically locked doors and wirelessly connect them online or offline to new, or existing, access control systems. This truly innovative approach decreases costs by reducing the door modifications required by legacy systems, without compromising the superior physical protection capabilities of the Aperio range. Visitors to the stand will be briefed on the Aperio L100 Lock, the world's first wireless lock range for security doors which features door monitoring; allowing real time access decisions to be made via the access control system. The stand will also display the latest version of Gallagher's celebrated Command Centre. The upgraded system resides on an organisation's IT network and integrates electronic access control, intruder alarms management, perimeter security and compliance management in a single scalable platform, providing situational awareness together with comprehensive command & control. The benefits of such a system to the education sector are readily apparent; providing one single intuitive, streamlined and effective security solution that minimises costs, can be easily maintained, and is managed from a central hub. The V7.10 builds upon Gallagher's 20 years' experience in the education sector to provide a platform characterised by flexibility which offers a range of helpful benefits. The Command Centre easily integrates with an establishment's resource booking system to ensure that security and access control are amended, in real-time, in accordance with a timetable's changing dynamics. Re-usable reports can also be created in minutes using filters that are powerful yet simple to configure, ensuring that the right people receive the right information at the right time. This innovative feature facilitates audit trails, provides increased protection for valuable assets by increasing room security during unattended periods, and provides significant energy savings through the control of amenities (such as lighting) by matching operational use with a timetable's fluid demands. To find out more about Gallagher's integrated security system, please contact: info@security.gallagher.co or visit http://security.gallagher.co for regional contact details.